First off, you will be pleased to hear that no crazy methods went into the making of these oats. In fact, the only really unconventional practice you’re undertaking with this recipe is adding some canned pumpkin puree (or homemade pumpkin puree, if you’re the terribly fancy type) into your oats once they have finished cooking. Flaxseed, traditional pumpkin pie spices and a drop of good quality maple syrup then tie the recipe together. Even if you’re normally a make-your-oats-with-water kinda guy/gal, I’d strongly encourage you to make these vegan pumpkin pie oats with milk. Firstly because pumpkin puree is a rather bland tasting ingredient, so a delicious creamy plant milk will make these oats taste their most flavourful. Secondly, because anyone who doesn’t make their oats with at least a half milk to water ratio is at best missing out, and at worst, mad. Again: kidding/not kidding. Andrew and I have had many a disagreement about this. He’s in the water camp, and I’m in the milk camp. However, we’re currently at the point where I’ve managed to wear him down enough that he’s now using 1/2 milk, which I can’t help feeling rather pleased and victorious about. Ah, it’s the little things when it comes to long term relationships, isn’t it? 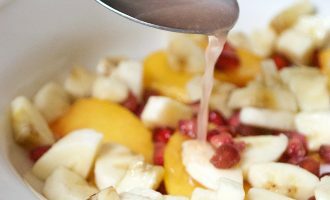 Prefer overnight oats to regular oats? 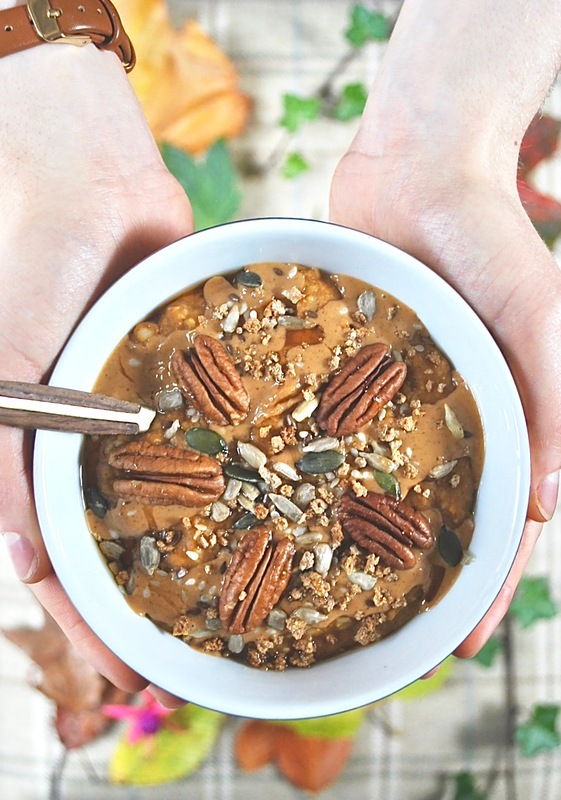 Then try my Perfect Pumpkin Spice Overnight Oats! Now, I need you to read carefully what I am about to say next. I do fear that, first with my passionate stance on milky oats and now this, you may be beginning to wonder whether I’d be better suited to life as a dictator than a food blogger. But I think this needs to be said. 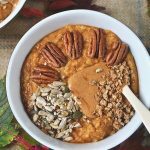 Here it is: Under no circumstances should these vegan pumpkin pie oats be eaten without a huge array of toppings. 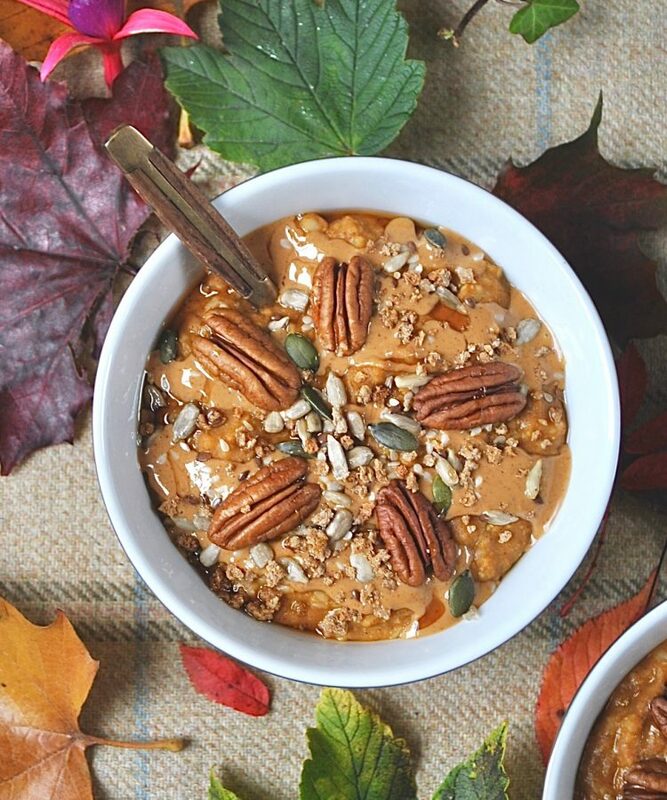 Put differently: these vegan pumpkin pie oats absolutely, categorically must be accompanied by a hearty spoonful of peanut butter, a little drizzle of maple syrup and a carefree scattering of crunchy mixed seeds to top. Otherwise, you’re not allowed to eat it. Sorry, I don’t make the rules! On a more serious note, I always find that no matter how delicious it is on its own, a carefully curated selection of toppings takes a modest bowl of oats to the next level every time. In fact, are people who eat topping-less oats less satisfied with life? I feel certain the answer must be yes. Unfortunately – or fortunately- I can’t test this one out on Andrew, as he (thankfully) also enjoys living the tons-of-toppings life. 1. Morrisson’s 100% Smooth Natural Peanut Butter. Ok, hang on a minute. WHY does this only have an average of four stars on the Morrisson’s website? Given that this is the best peanut butter I have ever tried, I think that is completely unjustified. Honestly – this peanut butter is delicious, made from 100% peanuts and a complete bargain compared to the price of most natural peanut butter brands. Don’t believe the haters. 2. Pip & Nut Smooth Almond Butter. I really didn’t understand the almond butter hype… until I tried this. IT’S BEAUTIFUL. 3. Meridian Peanut Butter with Pumpkin, Sunflower and Black Sesame Seeds. A mouthful I know – but a delicious one. This is quite a thick nut butter, so not ideal for drizzling, but it has a slightly more savoury peanut taste which pairs really well with both sweet and savoury dishes. So there you have it! Have you tried any of these nut butters? What are your personal favourites? I’m always on the lookout for something new to add to the collection, so please do tell. Likewise, let me know if you make this recipe! 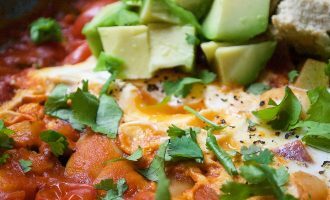 It really is a great one for using up canned pumpkin and squeezing one of your 10-a-day into breakfast. Yes – you read 10-a-day right! In case you missed it, a recent landmark study published in the peer reviewed International Journal of Epidemiology found that risk for coronary heart disease, stroke, total cardiovascular disease and death other than from cancer was reduced with each 200g a day increase in fruit and vegetables up to 800g a day, and 600g a day for cancer. The researchers concluded that up to 10 portions of fruit and veg a day is optimal for avoidance of the above outcomes. My personal view is that, sure, there are many potential confounding variables that may have yielded the statistics published in the study. Indeed, many public health authorities have been quick to label the research as unachievable for the masses. However, my overarching thoughts are that moving towards a more plant based diet makes complete sense for achieving positive health outcomes and reducing disease risk, because it will likely result in a move away from less healthy options. Additionally, although I don’t at all doubt that nutrition policy makers are qualified to make decisions on the majority of guidelines regarding public health, I do question whether it is fair for them to decide what is and isn’t achievable for the public in terms of food related behaviour, and to set the guidelines pertaining to this accordingly. How can we know what people will achieve unless we give them the option? What are your thoughts – does 10 portions of fruit and vegetables a day feel achievable to you? I’d love to hear your take on the matter. 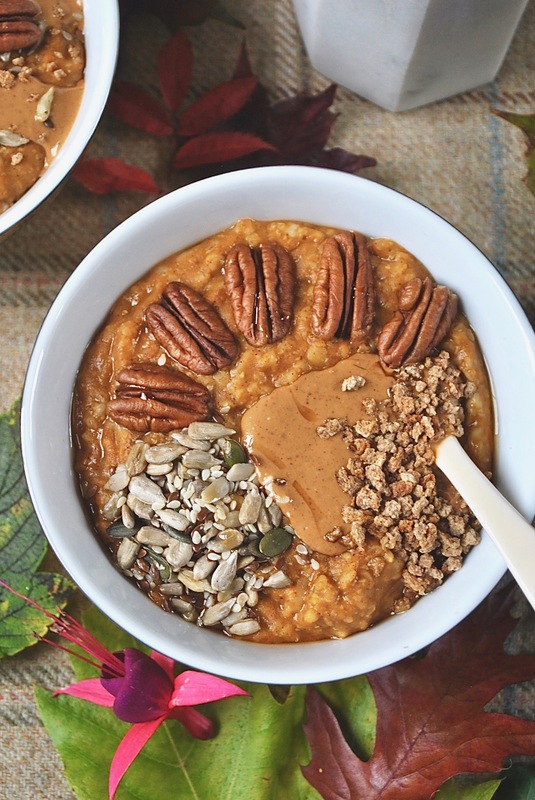 Will you be making these vegan pumpkin pie oats? And the big question: do you make your oats with water, milk or a bit of both? 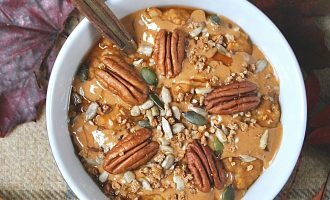 These vegan pumpkin pie oats are the perfect way to switch up your breakfast oats in time for the colder weather. Nut butter: not optional! In a pan, stir the oats, oat milk and water together and place on the hob. Cook for 5-6 minutes over a medium high - high heat, stirring gently. Once the oats are cooked, remove them from the hob and thoroughly stir in the pumpkin puree, spices, maple syrup and flaxseeds. Scoop the mixture into a serving bowl and top with the peanut butter, mixed seeds, pecans and maple syrup. *For two people, simply double the recipe.